Inpatients can become distressed at having to leave their pets unattended at home. During clinical placements throughout my nurse training so far, I have witnessed the anxiety and upset experienced by patients in hospital over who will care for their pets. This was particularly evident during a placement in the outpatients department in my second year, where I helped to care for patients who had to be admitted to hospital unexpectedly. Many of the patients had pets at home, and the thought of leaving them unattended caused them great distress. Some even considered delaying their treatment to go home to look after their animals. Identifying an opportunity to improve the patient experience and act as an advocate for these patients, I decided to create a ‘pet card’ that patients can give to healthcare staff to make sure their pet is cared for. 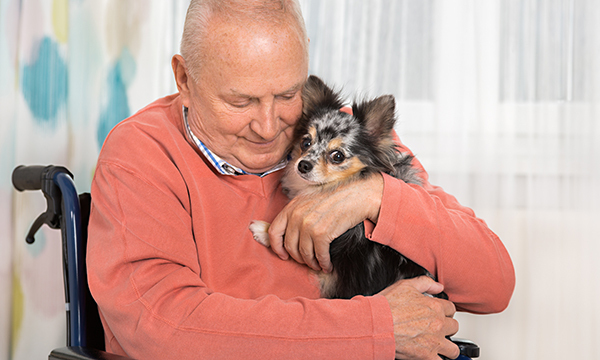 The wallet-size card contains the contact details of the person chosen by the patient to look after their pet while they are in hospital, reassuring the patient that someone they trust is caring for their pet when they are unable to. 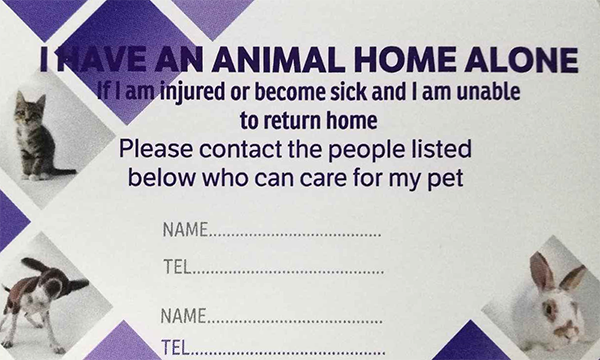 The patient can give the card to a nurse, or other health professional caring for them, who can contact the nominated person to ensure the needs of any pets are being met. I used purple as a colour theme as this represents the nursing student uniform in Wales. To implement this initiative, I started by contacting the patient experience team at Neath Port Talbot Hospital, where I was on placement, which was enthusiastic about the idea. The team said some patients are re-admitted to hospital quite regularly, and that addressing the needs of their pets by giving out the cards could make a positive difference to their hospital stay. The cards are now included as part of the hospital’s discharge process. The pet card is a small measure that can make a huge difference. The idea was welcomed by the department of nursing at Swansea University, where I am studying, which supported me to promote the innovation across all local health boards. Neath Port Talbot Council expressed an interest in handing out the cards to tenants who live alone and have pets. I have also given Swansea district nursing services 1000 cards to hand out to their patients in the community. Feedback from patients and families about the cards has been positive. One of the patients I cared for in outpatients, who was worried about what would happen to his dog when he had to be admitted to hospital, returned two weeks later for another outpatient appointment. I was able to give him a card at this appointment, and the gratitude he expressed was heart-warming. He told me he had nominated his carer to look after his dog, who had agreed to do this if he had to be readmitted to hospital. Prioritising people is one of the four key elements of the Nursing and Midwifery Council code. This includes treating people with kindness, respect and compassion, and listening to people and responding to their preferences and concerns. Creating and implementing the pet cards enabled me to put this theory into practice. By anticipating patients’ needs, I was able to reduce their distress and anxiety and promote better mental health. This experience made me realise what a huge difference the small interventions can make to patients, and how important it is to ensure the patient is always at the centre of care. It also helped me develop my communication and leadership skills, and I learned a lot about negotiation, managing complex situations and working with other services, all of which will help me become an effective and competent practitioner.